Bill Gardner was presenting the 2018 Logo Trend Report (not quite online yet, but it will be soon) at the HOW Design Live design conference in Boston. We ended up taking a bit of time to discuss logos, the difference between trendy and trend, amazing orange jackets at conference parties, LogoLounge and their now 15(!) books, and more. At last year’s LogoLounge party (my short post about the event here) at HOW Design Live, I saw Bill do an amazing magic trick. This year, I wrote about him doing another magic trick in the exhibit hall. So, we spend the first part of this episode talking about magic, and what it was like performing a trick for Muhammed Ali. I guess I have been an actual member of LogoLounge for almost eight years. I probably should have signed-up earlier, as I really do believe it’s beneficial to me, and more importantly, to the profession of design. When I review student portfolios, I always ask something like, “What type of work do you like doing the best?” and I would say at least half of the students respond with something like, “Logo design.” There is just something about the initial look of a company / cause / event – about distilling meaning and mission into something that still works at a fourth of an inch. Having a website dedicated to nothing but logo designs, presenting them well (and easily searchable), as well as putting the best of the group on the front page, well, I guess it reminds me of what we should be doing, the quality we should be doing it at, and the constant reminder that even in a format that we speak of wanting something ‘timeless’, that change is always needed. Take risks in logos. Make a logo look like it was created a long time ago, and yet also created in the future. Stefan G. Bucher of 344 stopped by the day after a fantastic presentation to AIGA Nebraska in support of his new book, Letterheads : An Eccentric Alphabet. A lot has happened since we last had Stefan on the show. Well, I would hope so, it’s been a full decade – I’m not even sure how that’s possible – but Stefan was actually on episode 2 talking about his just released Daily Monsters book, and a monster mural he was working on. This time we talk about 3rd-hand information I am trying to recall about the mural, his Letterheads book, rotoscoping a video, time travel, a yeti, a Jupiter poster, non-disclosures, non-competes, and more. Justin Dauer met with me just before the HOW Design Live Conference got kicked into full-gear in Chicago two weeks ago. In 2015, Justin wrote an article on “Resetting Agency Culture” for A List Apart. Like a lot of great creative things, something about it struck a nerve with people. And then the thoughts outlined in the article felt they needed a bit more room to breathe, so Justin started writing a book – Cultivating a Creative Culture. We speak of the article, the book, Street Fighter II, Batman v Superman, and more. Enjoy. Omaha’s Emspace Group (located just a few blocks, and across Pacific Street, from my office at Eleven19), got rid of their internship program around five years ago. Why? FORGE. In an effort to find a different way to give back to the graphic design community (as well as giving back to the public relations and marketing communities as well), they created a free program for the college students in the area. Over the past five years, I have spoke at a FORGE panel, attended most (if not all) of the final class panels / portfolio reviews, and spoken with many of the students about their experience. It was only a matter of time before we had a podcast talking about this great program. Lynn Schneider (who came up with the idea of FORGE), and Sarah Bergeron (a former FORGEr, and now on the other side of the FORGE) join us to talk all things FORGE, and where it’s headed next. Cody Fenske (a former FORGEr himself) joins me to co-host. Enjoy. 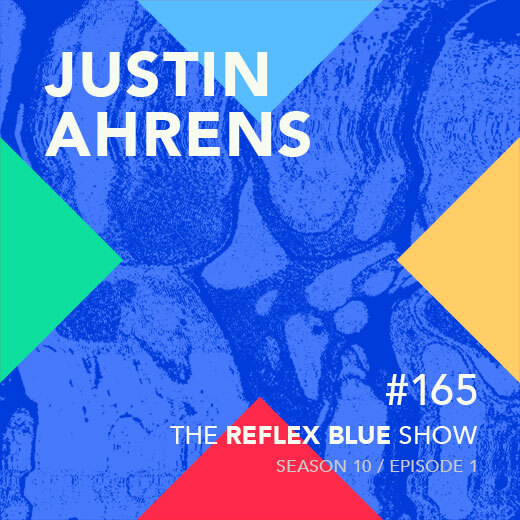 Justin Ahrens of Rule29, one of my favorite guests, joins the Reflex Blue Show to discuss his Design Of podcast, Wheels 4 Water, Designing for Good, AIGA (Justin just joined the National Board), and the coming up way too soon and yet not soon enough HOW Design Live 2017 in Chicago (where he will once again be a speaker). One of my favorite things about recording this show has been the ability to get to talk with some really great guests, and a lot of them. Somehow or another, Justin has been the only person, other than myself, to make at least one appearance on every season we’ve had, so I thank him for his availability, willingness, and ability to be able to talk about such a wide variety of design topics over the years. And when it comes to things that seemed to have come along way too soon, I guess this is the beginning of our tenth(!) season of The Reflex Blue Show. Along with the two-plus seasons of The Be A Cast we did before this, November marked eleven years of podcasting – hard to fathom that when Nate Voss, Tom Nemitz, and I first launched that episode back in 2005 – but the calendar keeps moving. And, a huge thanks to Cody Fenske for designing the podcast all new artwork for Season 10 (and as in the past, it may last a season or two more). He also designed some stickers (you know we love stickers around here) for the occasion, so if you see me throughout the year, be sure to ask for one.